dcdomain - r9: The Final Countdown to the end of the season. The Final Countdown to the end of the season. Somehow, I'm not so convinced that I'll be able to go boarding this weekend. Sad to think of it, but it may be true. But to celebrate for a wonderful season, amid the aches and pains (still), I've dedicated this fantastic album to this season. 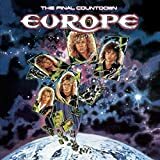 Well I'm sure others have their own music they want to remember this season by, and I struggled between this and some Beatles tracks, but ultimately, Europe was for me. How can you NOT love those mullets? When did you start boarding? I remember soliciting iFS members to go hit the slopes and you didn't sound interested back then. Did you start this season? hmmm song of the season? the winter season? the acoustic version of "round here" by counting crows is what came to my head. that, or "gravity rides everything" by modest mouse. i don't know what the criteria is to be "song of the season", though.